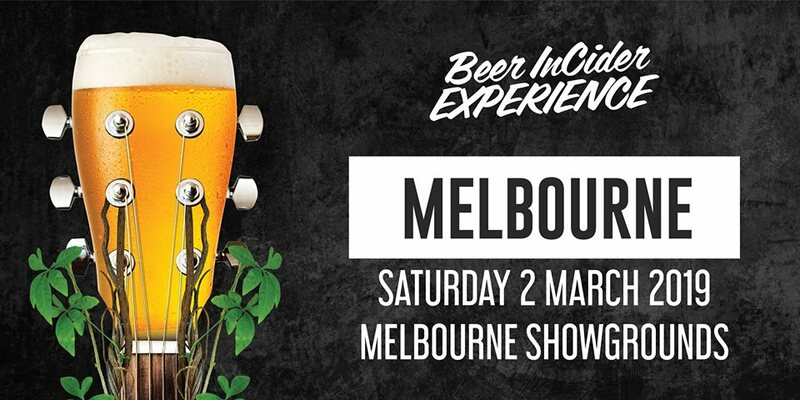 The Beer InCider Experience is just three weeks away and the countdown is on for punters who have already nabbed tickets for Saturday 2 March at the Melbourne Showgrounds. The Melbourne iteration of Beer InCider will be in one of the city’s largest and most versatile venues, where festival-goers can bliss out, cold beer in hand, to a music line-up headlined by DMA’s and Something for Kate, as well as Alex the Astronaut, WAAX, West Thebarton and Loser. Known for its fiercely independent format of local, interstate and international breweries and cideries, festival-goers can sample widely and discover new homegrown favourites. Brewers will be pulling pints of their core range – an added bonus for craft beer lovers who will get to meet their favourite brewer, ask questions and soak up the live music. Each year, Beer InCider reveals a special range of exclubrews which are one-of-a-kind brews made especially for the festival. This year’s beer collaboration that will see the pairing of Aussie rock legends, Something for Kate and Mornington Peninsula Brewery in an official festival beer that takes the form of a rye IPA called ‘Miracle Cure’ – an ode to the band’s song from their 2012 album, Leave Your Soul To Science. The foodie line-up includes food-trucks and stalls, pop-up restaurants and even a “Little Smith Street Precinct” to delight Melburnians as they explore the showgrounds. Highlights so far include 8 Bit, Red Sparrow, Hoy Pinoy BBQ, Brisbane’s Gnocchi Gnocchi Brothers and more. Other activations include live artists in residence, industry heavyweights conducting panels on the Brewers Stage, and Balter Brewing’s Tins of Glory making a splash to encourage mass game action. In true Beer InCider style, punters can expect a Ping Pong Arena with mini-stadium seating for those game enough to try ‘Berlin-style’ ping pong, which will go hand in hand with the festival’s signature tasting paddles that take the shape of a ping pong racquet. Seeking to elevate the Beer InCider experience? Young Henrys VIP tickets will include the added luxuries of a personal rider, special access to side of stage viewing, private toilets, food and beverage vouchers, and even your own tinnie bar with cocktails and wine. Young Henrys VIP tickets go for $295 (+BF) and are available until allocation is exhausted. Third release tickets are on sale now for $60 (+BF).